Trillium is making some fantastic beer and I have been fortunate to make several trips down to visit the brewery in Boston and most recently the new location in Canton. This one came from the Boston location and I enjoyed it a few weeks ago. 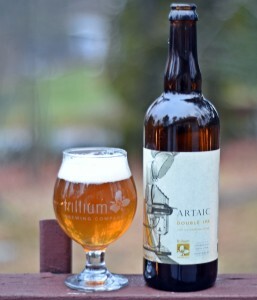 Artaic is a double IPA with 100% Mosaic hops and includes raw wildflower honey. Honey seems like an odd addition to beer but Anna from Hill Farmstead is great and Hopslam from Bell’s is also excellent and both include honey. Maybe honey is the secret ingredient as Artaic is truly exceptional. Pour is a very clear deep copper color with a thick bright white head that left a lot of lacing. Appearance is much different than so many of Trillium’s murky offerings. Aroma is peaches, mango, melon, citrus always amazed as the depth of aroma brewers can get from a single hop variety. Taste is very similar to the nose with plenty of citrus, tropical and a slightly sweet finish. Artaic is incredibly drinkable for an 8.5% ABV beer with light carbonation, very little bitterness. This beer is a unique take on a double IPA that works on all levels. Last time I only bought two bottles but next time I will bring home my limit. Brewer’s Description: Artaic Double IPA is brewed with 100% Mosaic hops in all kettle, whirlpool and two massive dry hop additions. Local raw wildflower honey keeps the body light and drinkable but provides a floral, earthy backbone. Juicy, candied peach and nectarine up front backed up with a nuanced white wine on the nose that continues straight through in the flavor profile. Pillowy soft mouthfeel, with a restrained bitterness on the finish. Artaic is an innovative Fort Point business that creates dynamic mosaics only possible through robotics.